As a boy, Dale Oscroft would encourage his father John to talk about his wartime experiences in the Sherwood Foresters. 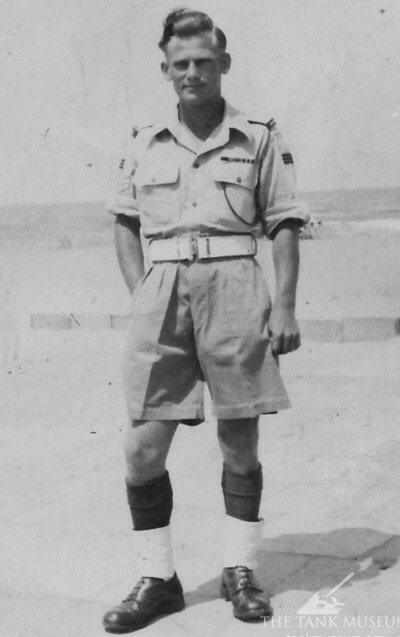 John was an infantryman who served on the front line in North Africa, Italy and Palestine with the 2nd Sherwood Foresters. Dale told The Tank Museum; “A reminiscence of his which has stayed uppermost in my memory is that of how the Foresters captured the first intact Tiger tank following the Battalion’s first set piece attack in Tunisia.” Photographed on his visit to The Tank Museum in 2012, he was struck by the similarity of the story The Tank Museum told and what his father had told him. John explained to his son that the start line for the attack was on the reverse slope of a somewhat lower ridge than the objective. The attack had to be made down into a valley and up the other side in order to dislodge the Germans dug in on the crest. He also told him that the position had been taken previously by another Battalion but that they had been forced off by a German counter attack. The men of the 2nd Sherwood Foresters contemplated their attack with some trepidation, but were heartened by the news that it would be supported by tanks. In the event, the tanks arrived late and the infantry attacked without them. Dale said; “He told me that the attack was a terrible baptism of fire and that heavy casualties were sustained in both the approach to and the fight for the German positions. After ejecting the Germans, the Foresters dug in on the position and prepared for the inevitable counter-attack which, when it materialised, comprised a number of Tiger tanks. “These approached the Foresters’ positions but without infantry support of their own they contented themselves with harassing the Foresters from a safe distance. Having the dubious honour of carrying a PIAT, my father was ordered to creep forward and engage the nearest Tiger. “After getting as close as he dared he took aim and fired, only to see the bomb strike a glancing blow on the turret and bounce off. At this point he saw the turret begin to traverse in his direction and decided to get his head down. “Fortunately for him, at this juncture the tank was fired on by an old French ‘75’ which the Foresters had taken from the Germans. Much to his relief the tank crew bailed out and made off. “Sometime after the Germans had withdrawn, the reason for the crew’s action became clear. 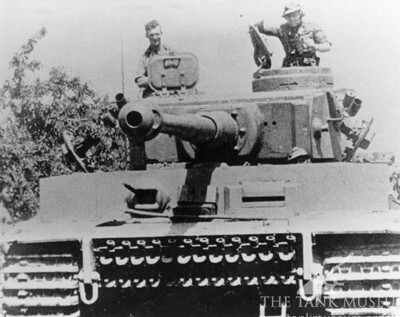 An inspection of the Tiger revealed it to have sustained a lucky hit on the turret ring which had jammed the mechanism. Dale’s father passed away in 1982, but whilst holidaying in Dorset in 2012 Dale and his wife visited The Tank Museum, where he was stunned at the similarity between the story of Tiger 131 and the story his father had told him decades before. It inspired him to find out more – and the more he found out, the more he realised there had been a mistake. The Sherwood Foresters attack, as described by John Oscroft, took place at Guhriatt El Atach on the 24 April 1943. 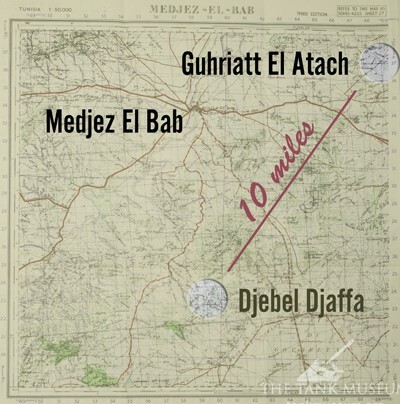 In common with military descriptions of such features, Guhriatt El Atach was known by the military as Point 174. Point 174 is about 10 miles away from Djebbel Djaffa, the location of the 48 Royal Tank Regiment action on 21 April. A piece of film shot by War Office Film Unit on 26 April 1943 and now held in the Imperial War Museum Archive shows a Tiger tank abandoned on the battlefield and is captioned: “Tiger tank captured by 2nd Battalion Sherwood Foresters after fighting west of Madjez El Bab.” As the camera pans across, German shells can be seen bursting around the position. Tiger 131 abandonned. This show shows the handle, step, damage to the right hand lifting eye and a smashed loaders hatch. 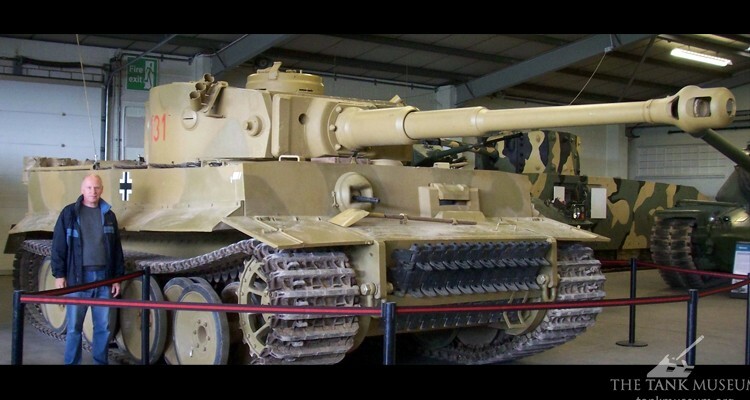 Tiger 131 has a several unique features that make it far more identifiable in photographs and film than other Tiger 1 tanks of the period. The small step and handle welded to the front of the tank appear to be unique crew modifications and the damage from the battle was retained during the restoration of the tank. Both the modifications and the battle damage allow the certain identification of the tank in the War Office footage to be Tiger 131 – but where was the film shot? In the course of his research Dale Oscroft approached David Byrden, editor of Tiger1.info, for assistance. 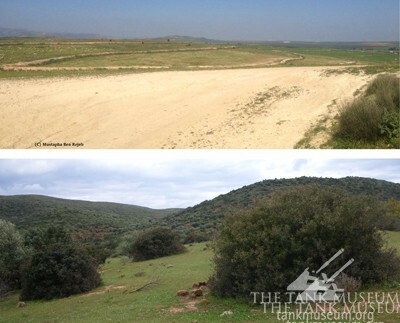 An expert in Tiger Tank companies of the Tunisian campaign, Byrden analysed the landscape in the background using the topographical 3D imaging tools in Google Earth. You can find out more about this, and read the analysis in depth here. He felt he had found a match. To be certain, he was assisted by local Tunisian Agronomist Mustapha Ben Rejeb who visited the suspected location to take photographs of the terrain. He was then convinced the film was shot at Guhriatt El Atach – Point 174. 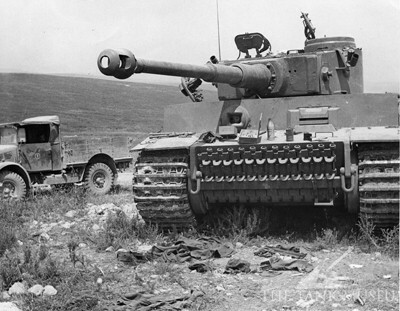 Tiger 131 was photographed many times at this location; the terrain being identifiable as relatively clear and barren. In contrast, the terrain at Djebbel Djaffa is far more coated in scrub. 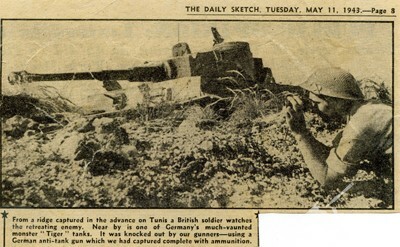 An article from the Daily Sketch dated 11 May carries an image of a Tiger tank with the caption: “From a ridge captured in the advance on Tunis a British soldier watches the retreating enemy. Byrden’s work confirmed that Tiger 131 was 10 miles away from the spot from which the ‘accepted history’ informed us it was abandoned. With this and the Daily Sketch article corroborating John Oscroft’s recollections, there was new doubt cast on both the accuracy of Peter Gudgin’s well-repeated testimony – and now the involvement of any British tank in its disabling. Click here for Part III –Major Lidderdale’s Recovery. and Part VI – What Happened at Point 174. Dale Oscroft for his research, David Byrden, editor of Tiger1.info, for his photo analysis & Mustapha Ben Rejeb visiting the battlefield and taking photos of the geography. And to John Oscroft, Peter Gudgin and Douglas Lidderdale for leaving a record of their service. Read more about the Churchill and Tiger tanks, as well as the history of tanks from their conception onwards, in the books below.